Each chapter evaluates natural processes for a specific ecosystem, describes drivers of change, and discusses how that ecosystem may be altered in the future. 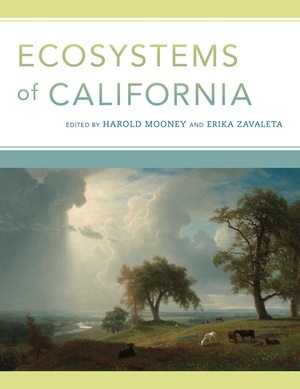 This book also explores the drivers of California’s ecological patterns and the history of the state’s various ecosystems, outlining how the challenges of climate change and invasive species and opportunities for regulation and stewardship could potentially affect the state’s ecosystems. The text explicitly incorporates both human impacts and conservation and restoration efforts and shows how ecosystems support human well-being. Edited by two esteemed ecosystem ecologists and with overviews by leading experts on each ecosystem, this definitive work will be indispensable for natural resource management and conservation professionals as well as for undergraduate or graduate students of California’s environment and curious naturalists. Harold Mooney is Professor of Environmental Biology at Stanford University and a member of the National Academy of Sciences. He has authored over 400 scientific articles and is coeditor of Methods in Ecosystem Science (Springer, 2013) and Invasive Species in a Changing World (Island, 2000), among other books. Erika Zavaleta is Professor of Environmental Studies at University of California, Santa Cruz. Her research bridges ecological theory with conservation and management practice. She received the 2008 Sustainability Science Award from the Ecological Society of America and has published in Science, Nature, and the Proceedings of the National Academy of Sciences.